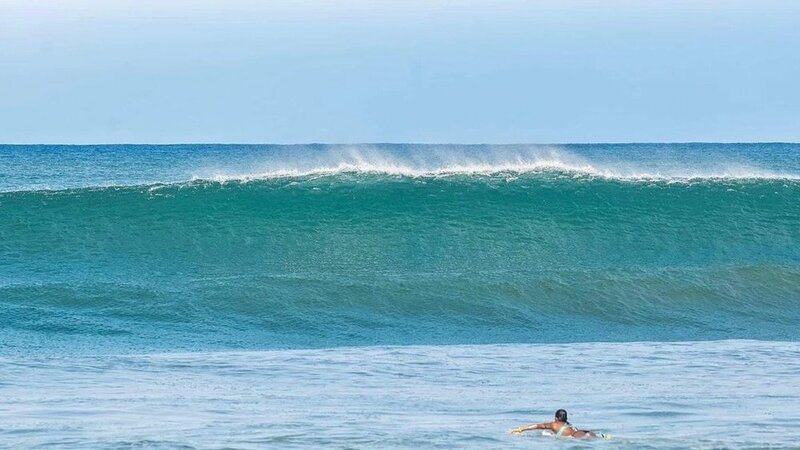 Surf + Brunch Nosara on November 30th will feature offshore winds, the quintessential Tica breakfast spread, and discussion with two-time Costa Rican surf champion Andrea Diaz and surfeminist scholar Tara Ruttenberg. Get tickets here. Just weeks after floods consumed the town adjacent to Katherine Terrell’s home base in Playa Guiones, another weather disaster rocked her former neighborhood in Malibu with terrifying, climate-fueled fires. These two places are affected by opposite problems — parched land and high winds in California, and the juxtaposition between non-absorbent concrete developments and rain-soaked jungle in Nosara. But these disasters were not a wake-up call for Katherine, whose activist brand Jeux De Vagues is behind the Surf + Brunch series. She’d known already that climate change is not just imminent; it’s upon us. In a world where ‘the establishment’ continues to deny and deflect the issues most directly threatening humanity, communities must take hold of their power: individually and collectively, inwardly and outwardly, electorally and, where the system fails us, as renegades. Citizens of Orange County took power by breaking the Republican stronghold to flip every single district blue this November, a shift influenced by grassroots events like Surf + March where surfers took to the streets to fight for their future. Some thirty women took power in Malibu at the inaugural Surf + Brunch by commandeering a lineup that was once exclusively open to men, and still largely operates under rules from that era. On November 30th, women will assemble in Nosara for the next chapter of Surf + Brunch to take power by confronting difficult matters head-on and charting a path forward. Andrea will be joined by Tara Ruttenberg, multitalented freesurfer, teacher, and PhD candidate in development studies at Costa Rica’s University for Peace. Tara’s writing has of late ruffled patriarchal feathers across the surf industry as she boldly calls out entrenched power structures. Those who benefit from these structures are often reluctant to face the discomfort that comes with acknowledgement, instead reacting with deflections and denial, but Tara’s resolve is powerful as she takes on the heavy work of explaining and re-explaining patterns of injustice. Her writing is distinguished by a courageous vulnerability and poetic flair, and to those prepared to hear her message, it resounds. With extensive background in academia and beyond on the impacts of tourism for better or worse, Tara is well-prepared to take the surf colonialism bull by the horns. “Surf colonialism [is] the heavy footprint of surfing settlers and surfing tourists all over the world, whose powerful social and environmental impact is weathered in ways that transform local landscapes and cultures while often worsening social inequality, devastating nature, and contributing to resource depletion in every country with a surf-able coastline.” She speaks to the entitlement that accompanies the normalization of these colonial relations, as outsiders blinded by privilege and capitalist wealth take from communities without giving back in any meaningful way. So how do we decolonize? Tara recommends starting with the literature (her own co-authored chapter in the Critical Surf Studies Reader as well as Dina Gilio-Whitaker’s work on settler colonialism in surfing), and then looking inwards. “A moment of awareness [is needed] toward shifting our own behaviors in socially and ecologically responsible ways,” she writes. Surfers feel at home wherever there are waves to be enjoyed, but it’s imperative that we remember our own positionality as guests, that we do the work of understanding the communities and historical contexts we step into, listen to their needs, and act in response. Without this background of reflection and openness, foreign aid and ‘voluntourism’ become self-serving activities that have little positive impact – or even a negative one.